Tim Johnson had just sat down to enjoy lunch with his mother Monday when he got an unusual phone call. "It was the weirdest call. He said, 'Can you play soccer in an hour?' " Johnson heard Madison United Juniors teammate Eric Vivier asking him on the other end. "Landon Donovan is going to be at Keva." "Well, yeah, I can make that. ... I'm like, 'Mom, I've got to go. This is pretty much a once-in-a-lifetime opportunity, so I've got to duck out on you.' 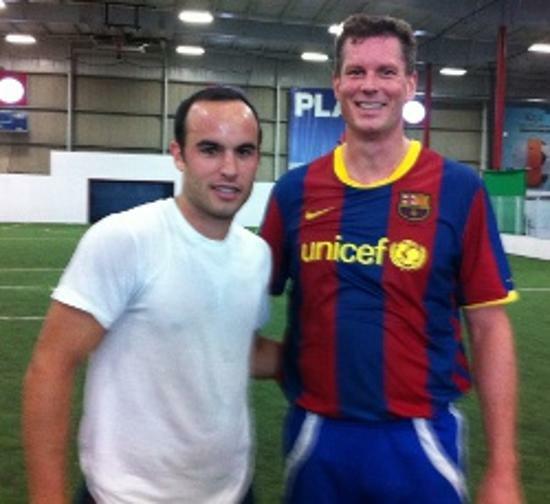 "
Donovan, the U.S. national team and Los Angeles Galaxy forward who will be joining Premier League club Everton on a loan deal starting Jan. 1, played in an indoor pickup game at the Middleton facility. He was in the area because his older brother, Joshua Diliberto, lives in Madison. Dante Viscarra, who also played in the game, said Donovan's mother and cousin were at Keva, too. The two-hour game included Diliberto, a local artist who also impressed as a player, and some of his friends – including Vivier. Two big things stood out to Viscarra during the two hours he spent on Donovan's team. "He's such a team player," said Viscarra, a native of Bolivia who added that he enjoyed speaking Spanish with Donovan and trading back-heel passes and give-and-goes with the veteran of three World Cups. "And he's faster than lightning, let you me tell you that much. Once he takes off, all you see is smoke coming out of his shoes. Good luck trying to catch him. Some of the guys were trying to (but he was) gone." Johnson, meanwhile, played on the opposing team. "Really good players are a dream to play with. I've played with other people who have played professionally before, and they just know what to do and when to do it," he said. "The passes are perfectly weighted, they do the right thing, they don't leave you asking for the ball – 'Hey man, I was open.' When you're open, they hit you, that kind of thing. Landon did all that. "But obviously he was just on idle. He was just there to get some blood in his legs, move around ... He just brought everybody into the game. He stood in the middle and when the ball came to him he did something with it, he tried to pass to everybody, he didn't try to dominate play. It was just a relaxing, fun, little thing. It's always nice to play with someone who is that good." Viscarra ended up ribbing Johnson, saying that he fouled Donovan on one sequence, a point the defender disputed. "No, I didn't foul him. If you could get a hold of him, you could ask him," Johnson said with a laugh. "I took the ball off him and had to slide in there in order to get it – not a slide tackle, but reach a leg in. We were kind of shoulder to shoulder and I had to get my hip in there in front of him to get my leg on the ball. It was clean. "Somebody whistled and I got the ball and I looked at Landon and Landon looked at me and he goes, 'That wasn't a foul.' And I go, 'I know.' Then we looked at each other like, should we stop play? And he said, 'Just keep playing.' Then I looked around and I was like, 'Was that my own team?' "
Still, it's not every day that the leading goal scorer in U.S. men's national team history (46 goals in 138 caps) stops in to kick around at Keva. "You never know who's going to show up to play noon ball here at Keva," said Henry Aiyenero, who is well known in the local soccer community as a youth coach and a player-coach for the Madison 56ers in the National Premier Soccer League. Aiyenero now lives in Evergreen, Colo., where he is the coaching director for Stingers SC, but is back in town for the holidays and was at Keva with his 3-year-old son Marius. All three men were impressed by Donovan off the field, too, as he patiently and politely posed for photos and signed autographs after the game. "He's just very down to earth and an amazing athlete," said Viscarra, who is a social media specialist at wisclatinonews.com. "It was a blast to play with him." Aiyenero said he joked with Donovan that he should come back in February and play with him to help the Almost Fire team defend its Over-30 title at Madison United's annual President's Cup tournament, while Johnson kidded with Aiyenero that the host club might claim him instead. Alas, Donovan isn't quite 30 – though he will be on March 4 – and his loan at Everton runs through February. This will be his second loan stint at the Liverpool club, as he had two goals in 13 matches in all competitions with the Toffees in January and February 2010. Donovan ranks third in MLS history with 115 career goals, and scored the lone goal and was the MLS Cup MVP as the Galaxy won the league title last month. A five-time member of the MLS Best XI, he had 15 goals and four assists in 28 matches in all competitions for Los Angeles this year. As for Johnson's mother, she took the lunch-time snub in stride. "She said, 'Do it, it sounds like a great time,' " said Johnson, who owns Madison marketing company SmallBizWithKids.com. Back row: Greg Wilcox, Keva league administrator; Dave O'Keefe, Keva director of fun; Landon Donovan; Molly Duffy, Keva assistant youth director; Sam Kilsdononk, Keva office operations manager. Front row: Henry Aiyenero and son, Marius. Other names not available. Photo courtesy of Keva Sports Center. 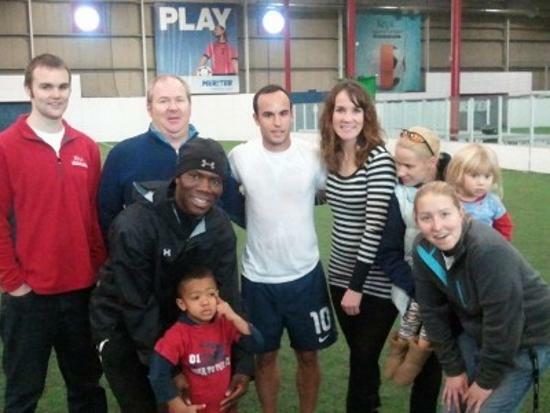 Landon Donovan and Tim Johnson. Photo courtesy of wisclatinonews.com. 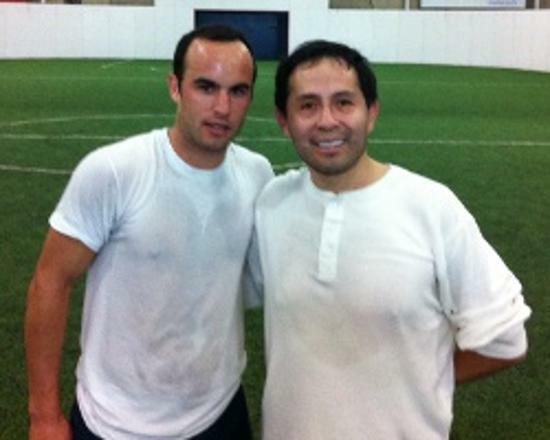 Landon Donovan and Dante Viscarra. Photo courtesy of wisclatinonews.com.